Sand is perhaps the most powerful substance on earth. Sand is basically rock broken down into its minutest substances — most commonly silica and quartz — in a process known as weathering. Finer than gravel and coarser than silt, sand is the foundation of some of the best things on earth: beaches, glass, and concrete. Kids and adults revel in squishy sand between their toes, and making sand castles is a defining childhood memory for most. One of the most common materials on earth, sand is also non-renewable in human years. People collect sand, and some species spend their whole lives in sand. Without sand, humans would not be able to see their reflections outside a pool of water (mirrors), buildings would suffer (steel), and roads would be even bumpier (asphalt). Sand is critical in many processes related to metal fabrication. Fort Miller FAB3 Corp near Greenwich, New York, uses sand or products made from sand in virtually all of our productive processes, including CNC machining and sand blasting. In today’s blog post, we’d like to explore the value of sand as a cleaning agent in our sandblasting metal processes. WHY IS SAND SUCH A GREAT CLEANING AGENT? Sand, being one of the most prevalent substances on earth, is available in most countries. With its rough and coarse texture, sand naturally makes friction when rubbed against other objects. 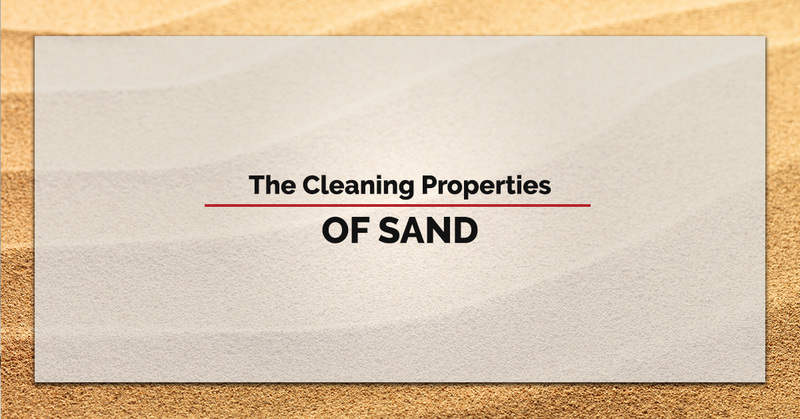 From ancient times, sand has been used in cleaning. Sand was used as rudimentary flooring in ancient times. In colder climates when animals were brought inside the home during the winter months, people would use sand for the animals’ waste products as it was easily cleaned up, thrown out, and replaced. Furthermore, sand would be used to absorb kitchen grease and spills and protect from stray sparks from the fireplace. From at least the sixteenth century, we have record that sand was a popular cleaning agent in most households in England. It wasn’t until the advent of indoor plumbing in the 1870s, which made water more accessible, that cleaning with soap and water began to replace the use of sand as the preferred cleaning agent. Sandblasting, the process of propelling sand under high-pressure on a surface to smooth it out, remove it of impurities, or shape a surface, was first patented in 1870. However, sandblasting (or abrasive blasting) had its origins long before then. The wind can serve as the propellant and, as anyone who’s seen sand dunes can attest, the wind can blow sand against surfaces and make noticeable changes. In fact, the American soldier named Benjamin Tilghman who filed the patent with the U.S. government admits he got the idea from seeing the wind blow sand against windows during his time in the military. Removes rust from equipment or other objects exposed to the elements. Smooths surfaces for painting and other design purposes. Blasts oil and contaminants. Sandblasting is a popular way for automotive shops to clean their flooring since oil, grease, and other not-so-friendly substances get spilled on the floor inherently. Non-toxic and safe for the environment, landfills, and waterways. Efficient and quick. A professional sandblasting service such as Fort Miller FAB3 Corp can complete a job that would take a lay person without the proper equipment in half the time. This is important to businesses with equipment essential to operation, and can cut down shutdown time considerably. Removes other substances from the surface of an object. Shapes surfaces and objects like glass into fantastic designs. Whether you’re looking to strip old, peeling paint from equipment, restore objects, or prepare a surface for painting, sandblasting by Fort Miller FAB3 has got you covered. We utilize a blast machine and 60 Grit Brown Aluminum Oxide in our processes. Sandblasting use is growing for decorative purposes as more and more people recognize the power of sand in creating unique and warped patterns in three-dimensional signage, artistic works, the decoration of glass, and the refurbishing of buildings. Fort Miller FAB3 Corp specializes in sandblasting surfaces to meet your individual needs. In our custom metal fabrication process, sandblasting is used before paint and to create unique designs for our clients. Contact us today for a custom quote!